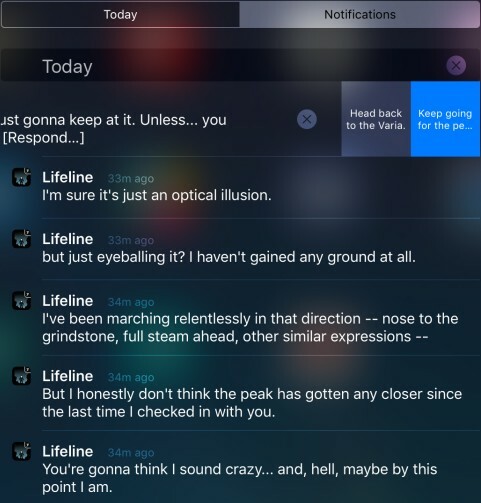 When Lifeline was originally released in 2015 for iOS, it became the number one paid app in the App Store. Although, in essence it was just a text based adventure, it took full advantage of interactive notifications introduced in iOS 8, creating an illusion of real-time communication with the stranded astronaut Taylor. The approach even earned it IMGA award nominations for excellence in innovation and excellence in storytelling. Today, the game has 2 sequels already, with all three games being available for iOS and Android. None of the games has been ported to Windows Phone yet. 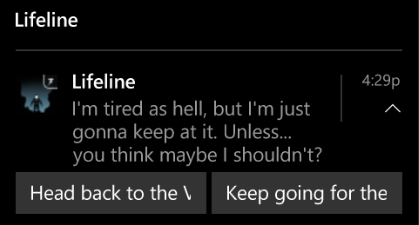 While Windows Phone 8 and 8.1 had no support for custom toast interactions, making the experience impossible to recreate, notifications in Windows 10 are on par with iOS and Android. In Windows 10 universal applications are not limited to a selection of predefined templates any more. Instead, they can be designed using a specialized XML markup language. A great tool for working with it is Notifications Visualizer, a simple editor with a live preview which also includes multiple predefined templates. <action content="Head back to the Varia." activationType="background"
<action content="Keep going for the peak." 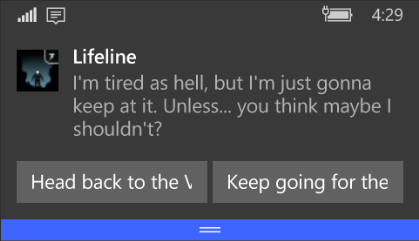 activationType="background"
Text = "I'm tired as hell, but I'm just gonna keep at it. Unless... you think maybe I shouldn't?" This way, replacing the hardcoded texts becomes much easier. 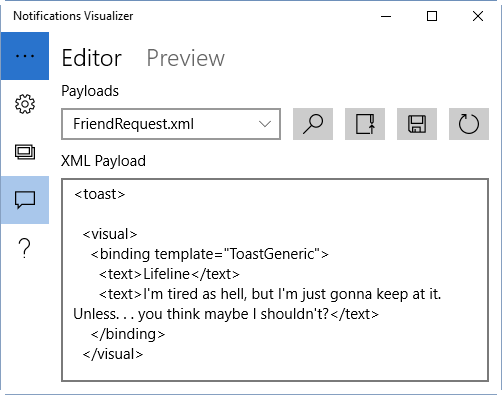 When a toast pops up, the user can read the text and select one of the available actions directly inside the toast, without even starting the application. Because of it, when the user just clicks on the toast without selecting an action, the application will launch with this argument (or activate if its already running). The argument can be processed in the App.OnActivated method toset the focus to the correct message in the history.